LOCATION.--Lat 43°42'03", long 73°59'00" referenced to North American Datum of 1983, Warren County, NY, Hydrologic Unit 02020001, on left bank 125 ft upstream from bridge on State Highway 28N in village of North Creek, 500 ft upstream from North Creek, and 26 mi downstream from Indian Lake. PERIOD OF RECORD.--September 1907 to current year. REVISIONS HISTORY.--WSP 621: Drainage area. WSP 1432: 1908-18, 1920, 1922. WDR NY-78-1: 1977. GAGE.--Water-stage recorder and crest-stage gage. 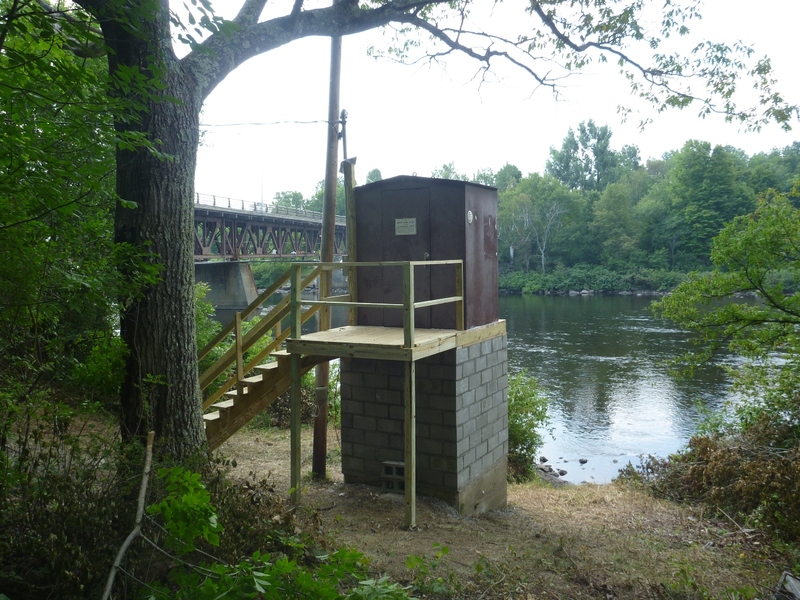 Datum of gage is 987.51 ft above NGVD of 1929 and 987.18 ft above NAVD of 1988 (VERTCON). Prior to Oct. 15, 1930, nonrecording gages at sites 80 ft and 125 ft downstream at same datum. REMARKS.--Appreciable regulation by Indian Lake (station 01314500), Lake Abanakee and other reservoirs upstream from station. Water Year 2014: Records good except those for estimated daily discharges and Apr. 16 to June 10, which are poor. Water Years 2015-16, 2018: Records good except those for estimated daily discharges, which are poor. Water Year 2017: Records fair except those for estimated daily discharges, which are poor. EXTREMES FOR PERIOD OF RECORD.--Maximum discharge, 34,900 ft³/s, Apr. 28, 2011, gage height, 13.65 ft; minimum discharge, 77 ft³/s, Sept. 4, 5, 2007, gage height, 2.02 ft; minimum gage height, 1.94 ft, Sept. 5, 6, 1999.